When I was in high school, we had to line dance in gym class. I’m pretty sure that the decision to include line dancing in the physical education curriculum was a cruel joke on the part of school administrators. Let’s put a bunch of suburban teenagers in a room and make them dance to Garth Brooks! Ha ha, that’ll show ’em! I hated line dancing. Hated it. There is really nothing sadder than an uncoordinated sullen goth girl doing the Boot Scootin’ Boogie. Not even a velvet painting of a crying clown is sadder than that. So one day during all this line dancing humiliation, the gym teacher turned around to change the CD and my friend turned to me and said, “Let’s leave.” And I think that was the moment in my life when I realized that I had free will. Yes! I could leave! I could just leave right now! Who’s stopping me? So we left. It was exhilarating. And we decided not to go to gym class again until the line dancing unit was over. Because we could do that! Then I decided I was free to not go to other classes either. When I got detentions for not going to class, I was free not to serve them. (Eventually, I accumulated so many detentions that the school just wrote them off.) It felt amazing to finally realize that no one could tell me what to do and that I was master of my own destiny, conductor of my own train, ringleader of my own crying clown circus. Even though I am no longer a sullen goth girl (I am still uncoordinated, though), this has kind of been my guiding philosophy in life ever since then. Although I feel the pull of obligations and expectations, ultimately, I know I’m in charge of myself and for better or worse, I do things the way I want to do them. I’d rather fail doing things my way than succeed doing things someone else’s way. I’m kind of stubborn like that. I’m a big believer in choices and I want the world to be like Burger King and let me have it my way, so when I post recipes on my blog, I tend to list a lot of options and substitutions. Because I want you to have it your way too! Take these Black Bean & Veggie Baked Tostadas, for example. 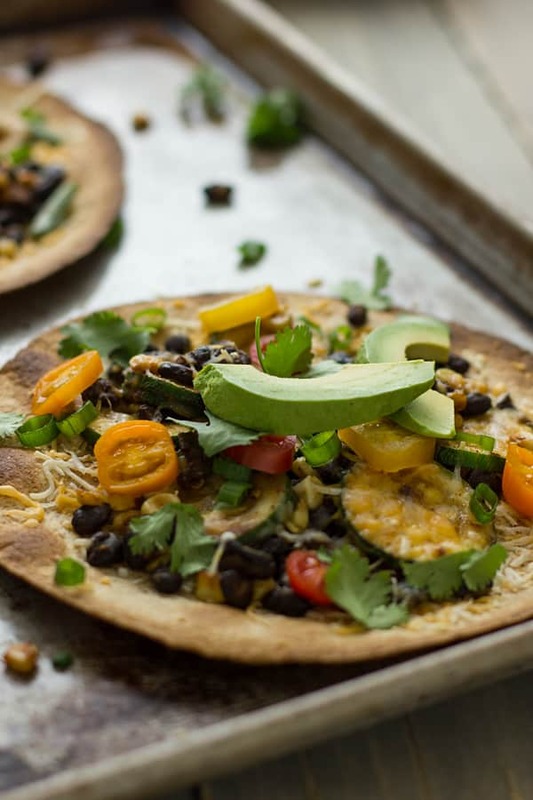 The starting point of this recipe is a crispy tortilla topped with seasoned zucchini, corn, and black beans. But after that, you’re the master of your tostada destiny. Chris had sliced avocado, cherry tomatoes, green onions and cilantro on his and since I’m much pickier than he is, mine were finished with a squeeze of lime juice and a scattering of cilantro and green onions. You can do whatever you want! This is one of those recipes that you really can’t go wrong with. 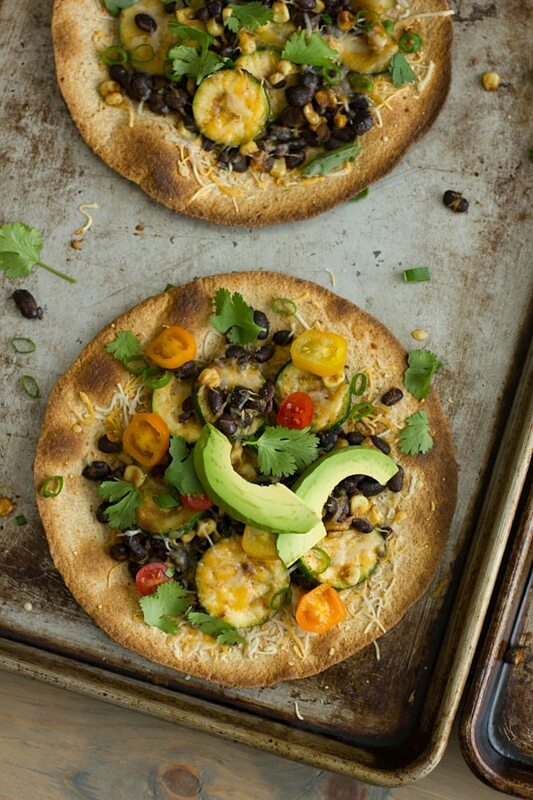 Crispy baked tostadas topped with black beans and veggies. And did I mention they only take 20 minutes to make? Heat olive oil in a medium skillet over medium-high heat. Add fajita seasoning, zucchini, and corn. Cook until zucchini is softened, about 3 minutes. Stir in beans and cook until heated through. Remove from heat. Place tortillas on large baking sheet that’s been sprayed with olive oil or cooking spray. Broil until crisp, about 2 minutes. Add 1/4 cup of cheese and vegetable topping to each tortilla. Return to broiler and broil until cheese has melted, 1-2 minutes more. Add toppings and serve. If only I had zucchini and avocado, I’d make these after work late tonight!! But they will follow very soon. Looks so good and so simple. I know, right?? And some bunny hop dance, the chicken dance, alley cat. *shudder* I don’t think any of those are folk either. Thanks for this recipe. I did my own version using your recipe as a taking off point and it was outstanding! I used corn tortillas and made mine vegan with black beans, a mixture of veggies, cilantro, avocado and lots of lime juice. YUMMY! And healthy! Thanks!! lovely, easy, and delicious meal! Yummers!! Love the addition of zucchini! I *love* this post. You are such a lovely (and funny) writer. The image of the sullen goth girl doing the Boot Scootin’ Boogie made me giggle so much (sorry, it sounds like it was quite torturous at the time!) For us, in Junior High, we had to do square dancing. But I actually loved it! SO much better than running miles (ugh). These tostadas are both so simple and so beautiful. I love that! I can laugh at it now, but OH MAN at the time, it was just the worst injustice ever. As everything was. Yummy!!! Looks fantastic! I literally crave Mexican food on a daily basis. This is going on my meal plan for next week for sure. Great recipe! These look so good and like a great alternative to tacos – our usual go to Mexican recipe! Looks yummy, but I hate the structural explosiveness of tostadas! And schools do not teach line dancing to teenagers to make fun of them. They teach it because it is cheap and doesn’t require the school district to spend money on sports equipment. Sad really. New to your blog. I think I’m probably older than all of you. Our folk dancing was an Israeli dance for one. We also did square dancing. I don’t think line dancing was invented yet when I was in school. Anything was better than climbing ropes and running laps. Oh yes, I was completely incapable of rope climbing–I think I could climb maybe a foot or two. 🙂 I hope you enjoy the recipe! These were so good. And senior son who moans intensely when he has to eat zucchini said they actually tasted good in this recipe. And ate two. Oh my goodness. These look so simple and delicious! They’ll be perfect for a quick dinner this summer, when the garden is booming. We did not have line dancing in gym class but I imagine that was probably the worst.